Solar panels require regular cleaning just like windows. They get dirty from pollution, general grime and bird droppings. All these factors will reduce the efficiency of your solar panels. Solar panel manufacturers recommend that you have your solar panels cleaned every 6 months. AJB Window Cleaning clean solar panels using our pure water reach and wash system. The solar panels are cleaned with a soft bristle brush which will agitate the dirt on the panels which will be rinsed off with pure water leaving your panels clean and spotless to maximise the energy that they produce. 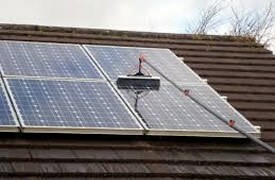 AJB Window Cleaning provide a solar panel cleaning service in the Maidenhead and Thames Valley area.